Never ones to shy away from a solid Collector's Edition, Bethesda announced today that very object of your desire is now available for pre-order from your favorite game/electronic retailer . What comes with this new-fangled edition? I'm glad you asked, cause I have just...the...answer. Lastly, you'll receive your very own copy of the highly anticipated game. All in all, a solid offering, for the low, low price of $79.99. Consider my pre-order, ordered. 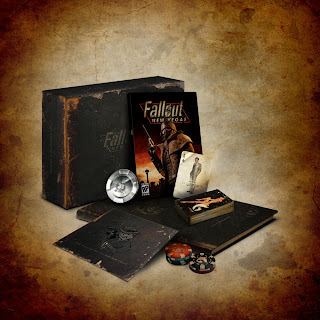 Fallout New Vegas is due out for PlayStation 3, Xbox 360 and Games for Windows (PC) later this year.